Experienced engineering support is available for all phases of the manufacturing process - from the customer design to final production. Northeast offers over forty years of intense design expertise in hermetic seals for military, aerospace, medical, automotive, and commercial applications. Our engineering staff is continually involved in customer applications, design, prototype construction, package testing, production assistance, and customer liaison. As a result, Northeast's design and engineering staff is a critical asset in meeting exacting manufacturing requirements and can assist or suggest ways of avoiding unnecessary design restrictions. 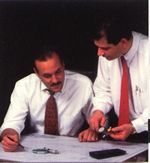 Staff engineers also help our customers design in consideration of their unique application factors such as thermal and mechanical shock, high mechanical stress, and compression type or matched type seals. Northeast customers are assured of practical, economical solutions... even in unique or environmentally extreme applications. Northeast makes a complete array of relay headers, flat packs, feed throughs, platform plug-ins, TO-headers, and octal bases. Accompanying drawings provide common configurations but the range of possible shapes, dimensions and sizes is virtually unlimited. Regardless of their configuration, the mechanical support, environmental protection, heat dissipation, and electrical insulation qualities of all the insulators are outstanding. Used in applications which range from medical, fiber-optic, high pressure, electronic connectors, electronic sensors, or other specialized applications, Northeast's specialized electronic devices can cost effectively match the most exacting standards. All devices are available in a broad selection of materials and physical dimensions. Northeast's capabilities and expertise span far beyond industry standard parts and the specialized electronics devices pictured. Examples of the many other specialty parts produced by Northeast include; pyrotechnic primers, relay headers, thermistor headers, battery headers, pressure transducers and gyro components.